Text-dependent questions are great because they bring students directly back into the text (hence the name). I've noticed in my experience, that it is easier to talk about our experiences with a topic or subject in a text than it is to actually talk about the text. The problem with that is that only those who already have experience or background knowledge about that topic will be able to engage in the discussion. We want our kiddos to spend as much time as possible analyzing and synthesizing the text before them. 3. questions that assess the understanding of the author's claims/arguments or connections with another text. 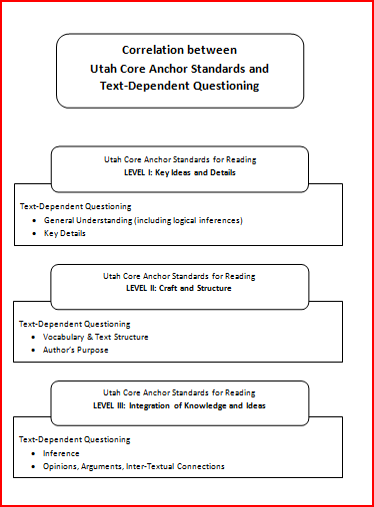 The fabulous people at my state office of education created a chart that shows the three different types of questions and how they fit into the reading anchor standards and the three repeated readings of a close read. For more information on that see my Close Reading Part 2: Reading With a Pencil post. ﻿This is a free download that can be found here if you are interested. The first step is to make sure that you are asking a question that brings students back into the text. If you are reading James and the Giant Peach, asking your students if they have ever eaten a peach is not text dependent. Make sure the question is something that can only be answered by going back into the text. Text-dependent questions begin by focusing on parts of a text like the words and details and then move on to the piece as a whole with things such as themes, inferences etc. This short video shows Fisher and Frey's model of creating text-dependent questions. 1. Identify the core understandings you want your students to understand about a text. 2. 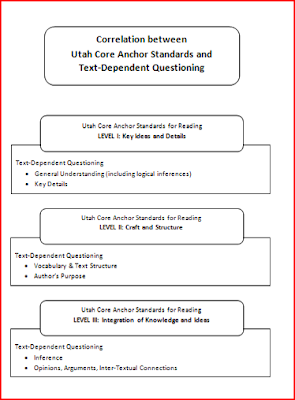 Start with level 1 (Key Ideas and Details in the Reading Anchor Standards) questions that talk about specific details and content. This is where I really think of right there questions. 3. Begin moving into level 2 (Craft and Structure) questions. Talk about the word choice, the set-up of the story: is it a poem, whose point-of-view is the text from, what are the arguments made in the text, how do the words that the author uses show their perspective etc. 4. Move on the level 3 (Integration of Knowledge and Ideas). What is the author trying to tell you? Is there enough evidence to support the author's claim? How does this compare to other texts/media on the same topic? An easy place to start is with your basal or reading program if you have one. They already have many questions prepared for you. Some of them are text-dependent and some of them are not. Usually, most questions just need small tweaks. The main question to ask yourself is "Does this force my students back into the text to answer the question?". If the answer to that is yes then you are on the right track. 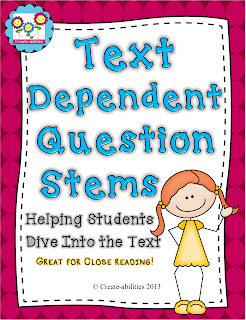 I just finished my Text-Dependent Question Stems product that can be found in its entirety by clicking on the link. I have created a FREEBIE for my awesome blog followers that you can download by clicking on the link below the picture. Now yes I know it gives you 14 examples and only 12 cards. I've been stuck in PDF purgatory all day and that's the best I could do after cussing in my head all morning! Well that was more long winded than I intended but I hope it was helpful! 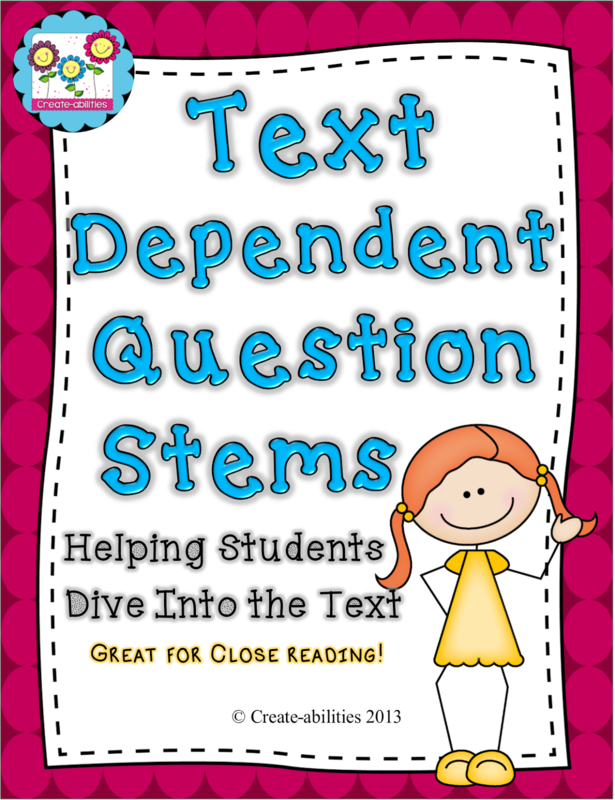 How have you used text-dependent questions in your classroom?